Harper wasn't deterred, though, and remained in high spirits as she continued her adventure. 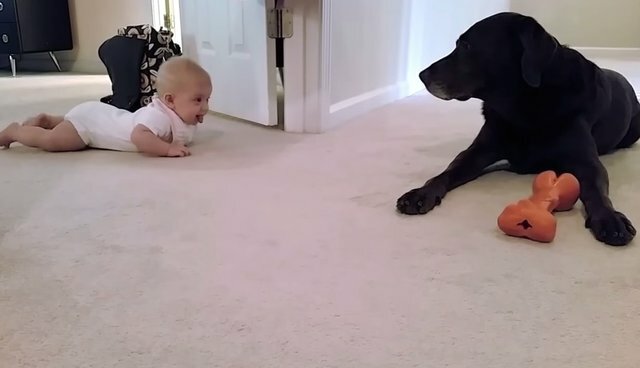 Savannah watched dutifully as the determined little baby wriggled her way across the carpet, not even turning away to look at her impressive chew toy. Harper made one last little lunge before stopping for a break, and received the sweetest bit of encouragement of all: a tail wag and a tiny little smooch from Savannah! That definitely made all of the physical exertion worthwhile. Hopefully Savannah will continue to encourage Harper all the way through learning how to walk! While Savannah is very gentle and caring with Harper, it is important to take proper precautions when introducing your pets to children and babies, and to always supervise during playtime.